Wales defender Neil Taylor says Brendan Rodgers would be welcomed back to Swansea City as manager. The Northern Irishman has been heavily linked with a return to the Liberty Stadium this summer, having left the club for Liverpool in 2012. The 43-year-old was sacked by Liverpool in October and Swansea's current boss Francesco Guidolin only has a contract until the summer. "Of course we would welcome Brendan Rodgers back," said Taylor. "He's a man who has done great things for the football club, so there is no reason why we wouldn't welcome him back." 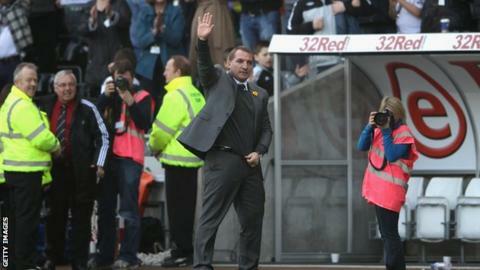 Rodgers led Swansea into the Premier League when the Welsh club beat Reading in the 2011 Championship play-off final. The Northern Irishman then guided the newcomers to safety in the top flight, playing such attractive football that it persuaded Liverpool to make him their manager in succession to Kenny Dalglish. But despite Guidolin being linked with a return to his native Italy to manage the national side, Taylor is still cautious about the likelihood of Rodgers rejoining his former club. "The word speculation is key though - we don't really know anything at the moment and we shouldn't really bother ourselves with it," Taylor told BBC Wales Sport. "We know he is a fantastic manager, but we've got more things to worry about between now and the end of the season." Swansea have almost secured their Premier League safety having opened up a 10-point advantage over the bottom three, although they have endured a difficult season. Garry Monk was sacked after only one win in three months and Alan Curtis was appointed interim manager. Swansea then named Guidolin head coach in January, with both parties agreeing to review the situation at the end of the season. One more victory is likely to be enough to ensure Swansea's survival, but left-back Taylor insists the players want more. "We just need to keep picking up results," he said. "We don't want to get one more win from seven games - it is criminal to only do that. It would be a really poor finish to the season."